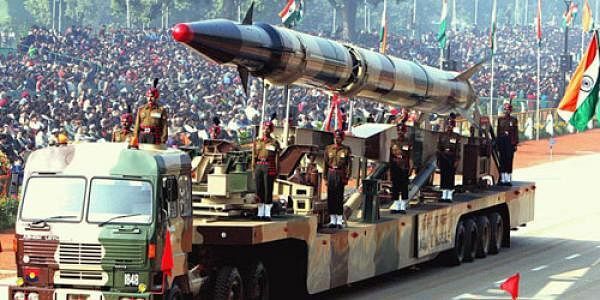 The Strategic Forces Command (SFC) of Indian army is all set to conduct a user trial of 2000-km range nuclear capable surface-to-surface missile Agni-II in real time situation from a defence base off the Odisha coast. Defence sources said the indigenously built Intermediate Range Ballistic Missile (IRBM) had been scheduled to be test fired from the Wheeler Island test facility, nearly 12 km from Bhadrak coast any time in between 9 am to 11.30 am on Thursday. An army official said though preparation has been completed for the test, it depends on a favourable weather condition. “If the test does not take place on Thursday, it would be conducted on August 12. A good weather condition is required to track the missile up to its full range,” he said. Senior officials of the army, Agni team and Scientific Advisor to Defence Minister and Director General of DRDO V K Saraswat have already arrived at the Wheeler Island to oversee the launch preparation. Prior to his landing at the test facility, Saraswat on Wednesday visited lord Jagannath temple in Puri and offered prayer that he does before any significant mission. The test assumes significance as a successful trial would pave the way for its deployment, sources informed. While the range integration has been completed and the missile integrated with the launcher, radars, telemetry systems and electro-optical tracking systems (EOTS) have been put in place. Naval ships with tracking equipments also have been positioned close to the point of impact. The aim and objective of the test is to make the army well versed with the missile system and to provide the armed forces required confidence to handle the weapon. Other parameters set by the user would also be proved during the trial. The two-stage missile equipped with advanced high accuracy navigation system and guided by a novel scheme of state of the art command and control system is propelled by solid rocket propellant. The missile, which has a length of 21 meters and a diameter of 1.3 meter, weighs around 17 tonnes. It can carry a payload of around one tonne. The Agni-II version of the Agni series of missiles was first test fired in 1999 from the same location and inducted in the army in 2004. It takes only 15 minutes for the missile to be readied for firing. Tight security arrangements have been made in and around Wheeler Island for the test firing.